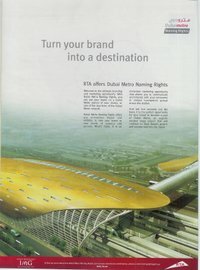 The Dubai Metro placed a full page ad in a recent Business Week announcing naming opportunities for both individual stations and complete subway lines. What corporation wouldn't benefit from having an entire subway line named after it? Or, for those companies seeking a cheaper rush, a station could be nice as well. I can already imagine people giving directions to friends: take the Halliburton from Purina, switch to the Unilever at Mattel, and get off at Bombardier. I suspect that there are some really jolly possibilities out there and I encourage anyone with good ideas to contribute. Dubai needs our help. By the way, this is not the ad...but it's as close as I could find already on the web.